Arakitoryo: Please tell us what made you go to the United States. Morishita: The peak season had come. The 70th Anniversary was over, and I believe it was about 1958. Rev. Yoshinori Kashihara, the third head minister of Myodo Grand Church, told me, “Morishita, will you go to the U.S.?” Although I had separated from my wife and was taking care of two children at the church, upon hearing the voice of my parent, I began to want to spread the path in a new place. Rev. Yoshinori had strong feelings for the overseas mission. In fact, when he was still young he went to do missionary work in Hawaii. He helped establish Taiheiyo Church. He then went to the mainland U.S. and did missionary work in California for three months. He then traveled around the globe. When the people beside him gave him a hand towel instead of the haori he requested, he began to lecture them and then said words something of the likes of: “Everyone, thank you for your hard work along this long journey. Please spread the path to the far ends of the Earth from now on.” He passed away for rebirth a week later. It was the year after the 70th Anniversary of Oyasama. Tenrikyo as a whole was promoting the overseas mission at the time. Further, Rev. Genjiro’s last words could be interpreted as, “I want you to spread the path to the far ends of the Earth.” Rev. Yoshinori must have thought the peak season to revive Myodo’s overseas mission had arrived. I was the only one who raised my hand. That was how I was singled out from the rest. I was on the committee of the Myodo Chapter of the Young Men’s Association. Rev. Yoshiro was the chairman. One day when the committee members had gathered, he said: “We’re not sure if we can make this a reality yet, but if we were to send someone here to go the U.S. to do missionary work, who’s willing to go?” I was the only one who raised my hand. That was how I was singled out from the rest. Arakitoryo: You went to the U.S. by yourself? Morishita: To tell the truth, before I departed, Rev. Yoshinori told me: “Morishita, you’ve got good style but there won’t be anyone waiting there to marry you if you take your two kids with you. I’ll set you up with a wonderful lady.” He then matched me with Myodo’s top joshi-seinen (young woman) and said, “Go ahead and have many kids.” So we were blessed with children one after another; we had seven in the U.S. That’s nine kids total when you add the two from my first marriage. Newlyweds Rev. and Yaeko Morishita flanked by Rev. Yoshiro and Kazuko Kashihara. Photo from Arakitoryo. I had nothing to depend on when I first went overseas. I merely willingly acknowledged the words of my parent. Yet I believe that I was led along splendidly by God and blessed by many children because I did so. When we consider Oyasama’s Divine Model, She fell to the depths of poverty in accordance with God the Parent’s intention. She did not promote Her own agenda. I merely did what my grand church minister told me to do. I believe that by doing so, I was able to follow even just 1/10,000 of Oyasama’s Divine Model. Thus, I’d like to tell all readers that it is important to respect the wishes of your spiritual parent. Arakitoryo: How did you do missionary work in the U.S.? Morishita: I was 35 when I went to the U.S. At first, they allowed me to stay at Gardena Church, which belongs to the Shuto lineage. I was able to speak some English because I did customs work but it was hard to convey the teachings in English. Thankfully there was the truth of the Sazuke. So I was able to do my work with spiritedness and enthusiasm. At first, I went around doing missionary work on a bicycle that Rev. Yoshinori bought for me. Even Rev. Muranaka, the head minister of Gardena Church, where I spent my first days, is said to have done missionary work on bicycle for 10 years. At first, I would go to administer the Sazuke to people I had been introduced to. From there, I would go to find new places where I would administer the Sazuke. These would mainly be places where Japanese-Americans lived. As I devoted my efforts to missionary work and hinokishin, I was shown many instances of wondrous salvation. Since I was not working at all, I had no money. Yet I wanted to return to Jiba. Also, I could not fail to make a donation if I did. So I would buy dilapidated cars, fix them up, and sell them. I was able to come up with the money after repeating this enough times. The dedication and installment service of Brotherhood Church. Photo from Arakitoryo. In the third year I began living in the U.S., it was going to be one more year before the 5th year memorial for Rev. Genjiro. I resolved to establish a church for the occasion. The first step was to establish a fellowship. Rev. Yoshinori named it “Brotherhood Fellowship.” I felt I had to do my best to make it into a church immediately. The momentum to establish a church began to build from that point. It just so happened that circumstances led a church that was directly supervised by Church Headquarters to sell its building and property. Negotiations went forward to allow me to purchase it. With the parental love of the second Shinbashira, I was appointed head minister of this old church and received the sanction to change its lineage and name. In 1962, it became Brotherhood Church. This is why I believe that I need to pour my sincerity into expressing my indebtedness to Church Headquarters and my grand church. Indeed, in any situation and at any time, it’s important to ride the waves of the peak season. I’m convinced you will receive fantastic blessings if you yield to the peak season. Arakitoryo: You also received instruction from Rev. Tadamasa Fukaya. Morishita: He came as the bishop of mission headquarters a year after I first came. He then assigned me to become secretary. I first declined, saying: “I didn’t come to the U.S. to become a secretary. I came to do missionary work.” But he pressed me, and I worked for him and he instructed me for the next five years. 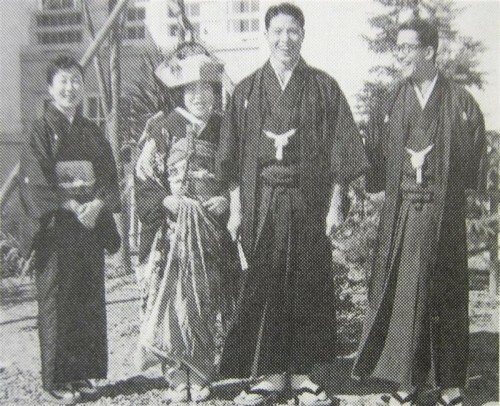 Bishop Fukaya would be strict in saying how vital the implementation and mastery of the teachings was for the path. That it was useless to just listen to the teachings, you had to embody and experience them for yourself. Even when it came to explaining the teachings as well as his efforts at sprinkling the fragrance and salvation work, he was a fantastic minister. At the time, there were no men at mission headquarters. So I did everything that had to be done. It was not rare when my duties ended late at night. I remember how Bishop Fukaya would sometimes mix in some jokes, saying, “Morishita-kun, we’re not at all deprived when it comes to the U.S. mission, but you can say we’re sleep-deprived.” Out of everything, what I enjoyed the most was driving throughout the U.S. with Bishop Fukaya. This experience would later greatly benefit me in my missionary work. I think it was two years after Bishop Fukaya came. The second Shinbashira desired to open a judo dojo. I was asked to make the preparations. But there was no money. It began really simply, with a few mats laid on top of concrete. The dojo was founded in 1962, the same year when Brotherhood came to be. There were no instructors at first, so it was left to me to teach since I had some experience. There were times I even had Bishop Fukaya and Secretary Shinomori put on black belts and teach. Although it was a humble beginning, we opened a dojo according to the wish of the second Shinbashira. 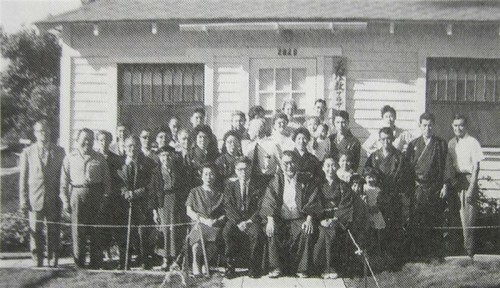 When he later came to the Mission Headquarters in America, he named it Los Angeles Tenri Judo Dojo. I believe that he thought that it was important not just to borrow the body from God but to train the body through judo. 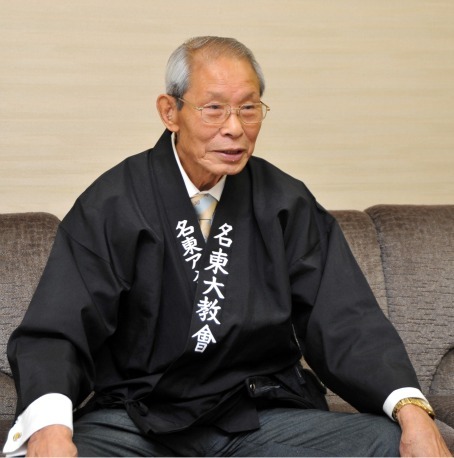 The second Shinbashira was passionate about sports in general. His feelings for judo were especially big. He must have learned a lot of things through judo. I believe that he thought that it was important not just to borrow the body from God but to train the body through judo. Through judo, I adhered to the intention of the second Shinbashira. In terms of the truth, I also adhered to my grand church. Believing there was oneness in two between them, I dedicated myself equally to both.